Great dimensional highlights in crafts. Use in costumes, props and seasonal decorations. Pack of 300 assorted colors and sizes. 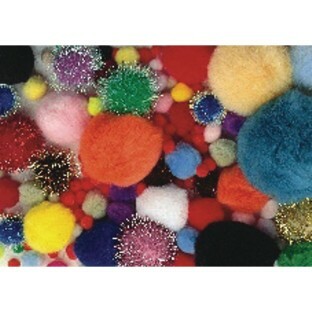 Vibrantly colored, wire-free, crush-resistant fluffy Pom Poms are great for craft projects, costumes, props and seasonal decorations. Pack of 300 assorted colors and sizes. We have bought these several times. Good variety and selection. who doesn't like pom poms? especially when they come in different sizes and colors. i tell you...kids they will make anything out of them and they do. Can be used for lots of different craft supplies and even reused again.